Kerala, the gods own country is a paradise for food lovers. Their love for traditional kerala food is immense. As fish is the staple food among keralites, the dishes with fish are countless and each dishes have a unique taste and flavour. 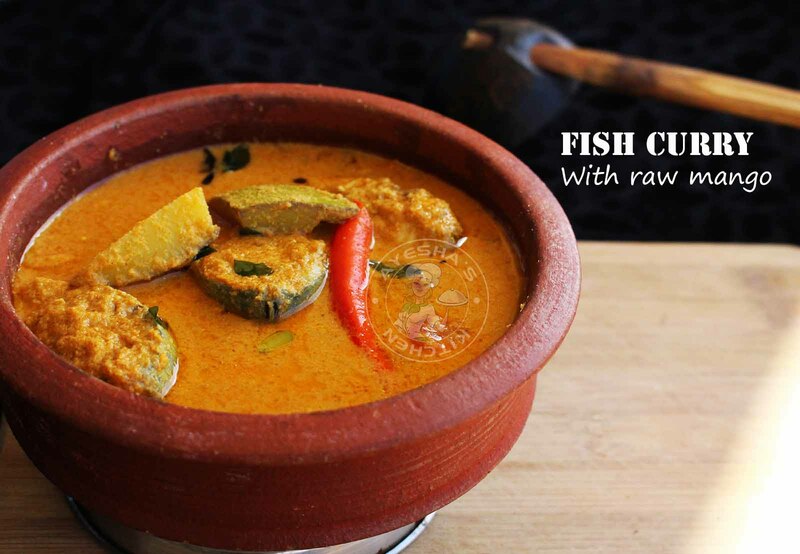 Kerala style Fish curry is one of the common fish recipes for lunch along with steamed rice. The taste of this curry varies according to region and districts. Fish curry with coconut and without coconut, raw mango fish curry, kudampuli meen curry (gamboge fish curry), fish pattichath, meen mulakittath (spicy fish curry), Tomato fish curry, red hot fish curry like so there are numerous collection of fish curry recipes. 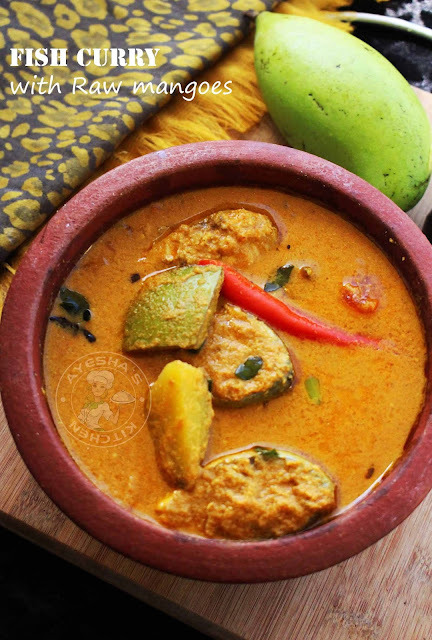 Today, let's see how to make raw mango fish curry / pachamanga meen curry / ayala pacha manga curry. Enjoy. Grind together coconut, small onion, fennel seed / perumjeerakam, (turmeric, coriander and chilli )powders in half a cup of water. Grind well until you get a fine thick paste (very important) . Set aside. In a non stick vessel or earthen pot, add chopped tomato, green chilli and chopped raw mango /pacha manga (Do not peel the skin of mango). To this, pour the prepared coconut mixture along with required salt. Add warm water according to the consistency needed. Now switch on the flame and cook for about 8 minutes over a medium flame. The masala / spices must be cooked enough to get rid of a pungent spice flavor. So cook until the raw smell goes off . Stir occasionally. Add hot water if required (do not add normal water). Check for salt. When done, add the fish pieces and swirl the vessel. Do not mix with a ladle or spoon after adding the fish slices. Close the lid and cook for few minutes or until fish is done. It will take around 5 minutes only. Do not allow to cook for long after adding fish as it will spoil the fish . Remove from flame. In a separate pan heat 2 tsp of oil and add 1 tsp sliced small onion / shallots. Saute well until golden and then add curry leaves. Switch off the flame. Pour this seasoning over the prepared curry and close the lid. Set aside for few minutes or until you serve. This gives a fine flavor the curry. Serve along with hot steamed rice or chapati or paratha etc.